To become a member you apply in accordance with our constitution and you will be notified once the committee has accepted your application. By applying to join, you agree to be bound by our constitution and byelaws, the same as all other members. Please send any enquiries about membership to membership@wagnersociety.org. We will do our best to help you. Whether you are already a knowledgeable Wagner enthusiast, or simply like what you have seen and heard and are curious to learn more – why not join the Wagner Society? You will meet many like-minded Wagner lovers, be able to attend our frequent lectures and recitals, receive our quarterly magazine and regular emails with news and events relating to Wagner, and you will also be able to participate in our annual ballot for tickets to the Bayreuth Festival. Above all, it will give you the opportunity to join a world-wide community with a common aim – to support, promote and enjoy to the fullest extent the sublime works of Richard Wagner. Becoming a member is easy – it costs £30 per year for single and £40 for joint membership (same household) – whether you are in the UK or overseas. Full-time students, young people under 30 and YPIA members can all join free with valid ID. You can join using our online system below or email us at membership@wagnersociety.org. Individual Member £30.00 per Year. Joint Member £40.00 per Year. Institutional/Library Membership £90.00 every 3 Years. The Society is run by a Committee of volunteers (see About Us on the site) and we are always looking for enthusiastic members to help us with our events, our magazine production, marketing and our website. So if you want to join and become involved, we’d love to hear from you. Please send any enquiries about membership and volunteering to info@wagnersociety.org. We will do our best to help you. 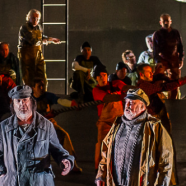 Der Fliegende Holländer at The Royal Opera House, Covent Garden, 2015.